"GET your cameras at the ready as the aurora borealis will be visible from parts of Britain tonight. Forget going to Iceland, Sweden or Norway – stargazers across certain parts of the UK might be able to glimpse the spectacular Northern Lights tonight. Following the reports of Northern Lights activity in the UK last night, experts have reported the possibility of further activity over the coming days. Experts estimate strong solar winds both this evening and on Sunday will spark further displays of the polar lights across England and Scotland." Dr Nathan Case, part of the AuroraWatch UK team, said: "Yesterday we issued a red alert because the Aurora was so strong. “We were being bombarded by a fast stream of solar wind which is continuing today. It’s definitely a possibility that the UK could see the Aurora again tonight." 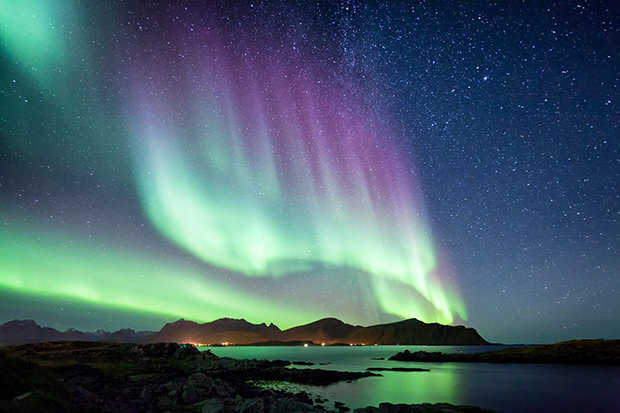 With the Northern Lights reported as far south as Southern Wales last night, Jonny Cooper, founder of Off the Map Travel and Northern Lights travel expert, believes we could be in for a good display tonight." snip Don't miss the slideshow of beautiful images in this article, enjoy! Two Taiwanese scientists claim to have recorded the longest-lasting rainbow in history, which they measured as persisting nearly nine hours at Chinese Culture University (CCU) in Taipei on Nov. 30. The rainbow was recorded on Nov. 30 by Chou Kun-hsuan (周昆炫) and Liu Ching-huang (劉清煌), both professors in the Department of Atmospheric Science, as they stood on the roof of the Dayi Building on the campus of CCU. According to Chou, the rainbow started at 6:57 a.m. and lasted until 3:55, or 8 hours and 58 minutes. If confirmed, this would shatter the previous record set in Wetherby in Yorkshire UK on Mar. 14, 1994, which was recorded as lasting from 9 a.m. to 3 p.m., or 6 hours. Rainbows usually require liquid water. Droplets falling out of the sky intercept beams of sunlight, reflecting them back in a colorful spray of red, green, and blue. Yesterday, Valtteri Immonen saw such a rainbow over Muonio, Finland, but something was missing: the raindrops. "It was -6 degrees C, no rain and no snowfall," he says. "Yet there was a huge rainbow across the sky." "I have never seen a rainbow during the winter and I didn't even know that it is possible for them to form when the temperature is below 0 degrees Celsius," he marvels. Stunning footage has captured the moment treated to the incredible sight of a rare ring of light surrounding the sun. The atmospheric effect enveloped the low winter sun with a corona, known as a 22 degree halo. They form as sunlight is refracted in millions of hexagonal ice crystals suspended in the sky. The breathtaking clip was captured by a skier at the Vemdalen resort in central Sweden. Ludvig Lundin shared the footage to Facebook, where over five million visitors to the site viewed the eye-catching distortion. Last nights amazing aurora show over Senja, Norway was nothing short of magical. The lights started very early (6pm) as a stable arc on the northern horizon. As it had all completely cleared up and started in a very good manner, I drove to the fjords to get some shots. As I arrived there it started developing already and danced for a bit. It rapidly died out into a faint pulsating aurora for at least 2 hours. I decided to take a few time lapses in the meantime and moved around a lot. However I felt like it was far from being over! I moved to Meforjdvær for the rest of the night around 10pm. I started shooting a milky way and aurora timelapse as the latter was very faint. Around 11pm though a faint band in the south moved northwards to zenith and developed into a first beautiful corona, but once again not fully blown. A few minutes later though it came back with full intensity and this image appeared. Huge colorful pillars taking the shape of a fiery bird." roaring silently in the sky over Iceland. The stunning natural wonder was caused by particles emited from the sun which smash into the atmosphere to cause a dramatic light display. Nasa wrote: ‘Have you ever seen a dragon in the sky? Although real flying dragons don’t exist, a huge dragon-shaped aurora developed in the sky over Iceland earlier this month. ‘The aurora was caused by a hole in the Sun’s corona that expelled charged particles into a solar wind that followed a changing interplanetary magnetic field to Earth’s magnetosphere.